From time to time, there are still people, who ask us if traveling to Sarajevo is safe. Sarajevo, the capital of Bosnia and Herzegovina, faced devastating war, but luckily it ended years ago. We can still see ruins and effects, which remind us that no war is good for anyone, but luckily Sarajevo did manage to safe its beauty and charm for everyone who decides to visit it. The old Sarajevo tourist attractions might be even more appealing and eye-opening due to new, post-war remains. Sarajevo lost more than 11.000 people during the terrifying war, but even thought, Sarajevo is still the largest city in Bosnia and Herzegovina. Before the war Sarajevo was also the only capital, where different religions lived neck to neck in peace, what was definitely one of best known Sarajevo tourist attractions. We could see a mosque, synagogue, catholic and orthodox church just few steps away from each other. Different religions are present in Sarajevo for centuries and that is why some people called Sarajevo Jerusalem of Europe. Sarajevo overcame some great changes because of the war, which lasted for almost 4 years and ravaged all around Bosnia and Herzegovina. The war in Sarajevo demolished homes and lifes of many, but the most devastating affect did left on Muslims. 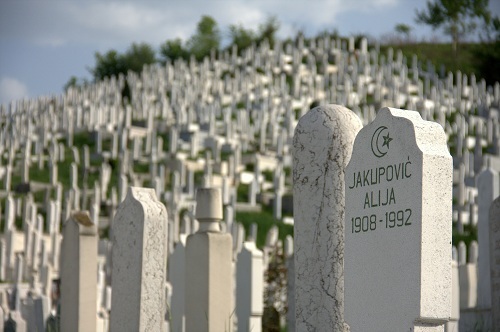 Sarajevo is circled with cemeteries. Looking up the hills will reveal the white tombstones of (too) many innocent victims. We could not ask ourselves if we are ever going to learn anything from our history. This is one of the new Sarajevo tourist attractions, which should not ever be made. If you think the cemeteries will shake you around, think again. There is another place to look for, when you are in Sarajevo. 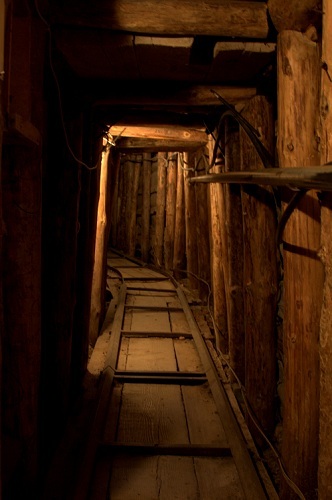 It is called »tunel spasa« or tunnel of rescue. It was made during the war and the starting point was a back yard of a Muslim family. The tunnel is 800 meters long and needed 4 months to be dig up. It lies under the airport lane. Lots of people were rescued because of the tunnel. The tunnel meant the only connection with siege city and the world. If you are interested in Sarajevo war or not, you should check it for sure, as it is one of best post-war Sarajevo tourist attractions. The biggest and maybe best known Sarajevo tourist attraction is with no doubt Baščaršija. This is actually cultural and historical center of the city. 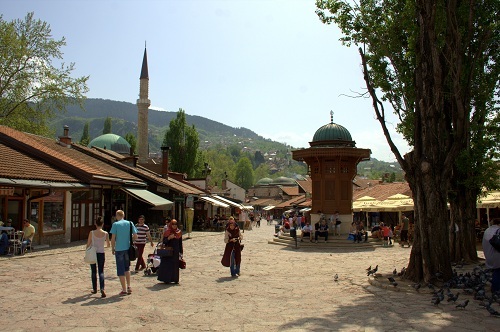 Visitors come to Baščaršija manly because of Sarajevo’s old bazaar, which is here ever since Ottoman Imperia conquered the grounds. If you ever visited Istanbul, you will see slight resemblance by visiting Baščaršija. Sit in one of its many cafes and indulge yourself with the real Turkish (Bosnian) coffee and enjoy the vibrant atmosphere in Baščaršija. 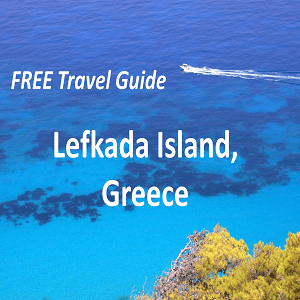 Explore the small workshop, where traditional copper goods are being made. 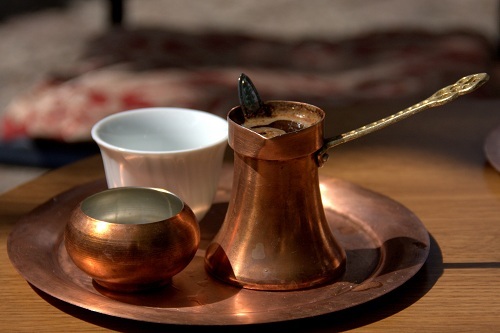 If you are into buying a souvenir, take the typical coffee sets, which will remind you best on your visit to Sarajevo and which we can easily mark as one of best Sarajevo tourist attractions. If you are into traditional Bosnian cuisine, find a small fast-food alike bakery where bureks and pitas are being made. 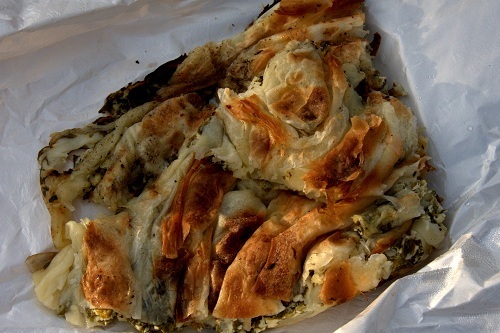 We love different styles of its drought pastry, filled with fillings like potato, cabbage, spinach, cheese and minced meet. The best are warm, so ask if it’s baked fresh and have it for a snack. They go best with plain yoghurt. One of best recognized yummy Sarajevo tourist attractions for sure! 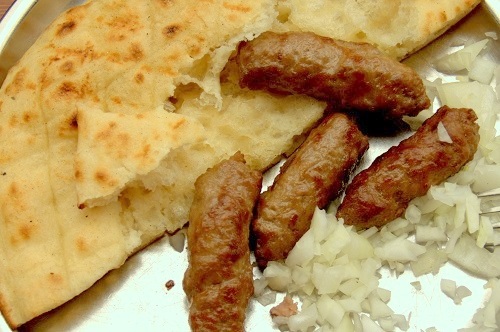 Burek or pita can be for a snack, but real Bosnian lunch in Sarajevo should be čevapčiči. They are made out of minced meet and grilled over the embers. They are served with lots of freshly chopped white onion, ajvar (roasted red pepper and eggplant relish, adding garlic), kajmak (unripened cheese similar to clotted cream) and flat bread. They are delicious and they go great with beer or rakija (distillation of fermented fruit), but if you eat them in a traditional »čevapdžinica«, alcohol is not served. 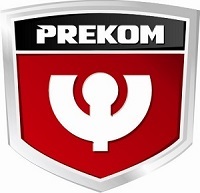 It is said that the best čevapčiči can be found at Željo, on Baščaršija. If you are staying in Sarajevo overnight (highly recommended), head up in the evening to a nearby fort ruins. The views are amazing from up there and can show you bitter-sweet taste of Sarajevo. Not only beauty can be seen from up there, but also so called post-war Sarajevo tourist attractions – hills covered with white tombstones and damaged buildings from fires and shooting. These should never stay unnoticed and should be there as a reminder for us all. More and more travelers are visiting Sarajevo and that is also why there are more and more accommodation options available. 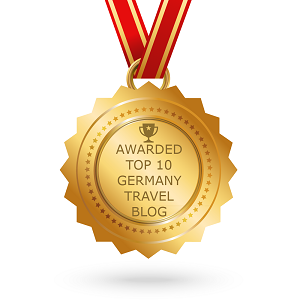 You can check them out at booking.com. 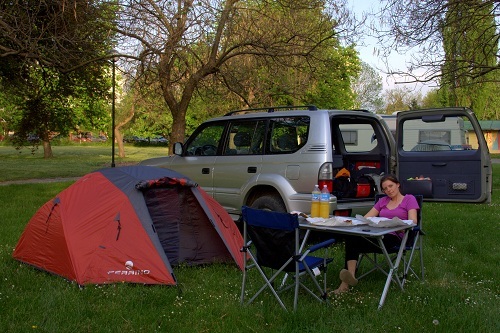 If you are visiting Sarajevo, when the days are longer and warmer, you might also consider camping. 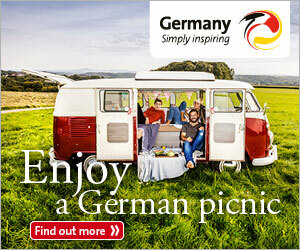 You will find camping Oaza on the outskirts of the city. Sarajevo tourist attractions are definitely worth seeing, so don’t post-pone your visit for too long. 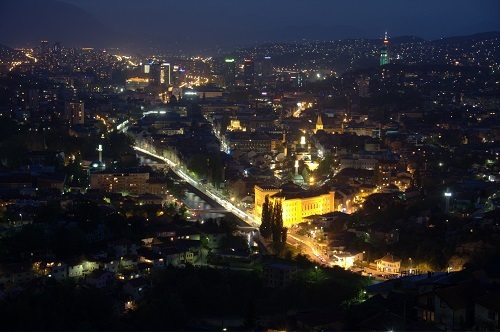 Sarajevo is changing rapedly and if you want to get the taste of the real one, head there as soon as possible. We are sure you will not be sorry as with its unique Sarajevo tourist attractions, there are many things to do in Sarajevo.